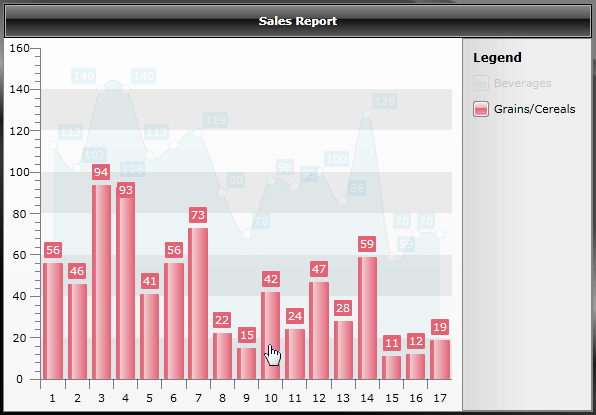 The purpose of this topic is to demonstrate the selection/hover interactivity effects supported by the RadChart control. HoverScope - gets or sets a value indicating the scope of interactivity for hover effects. SelectionScope - gets or sets a value indicating the scope of interactivity for selection effects. SelectionMode - gets or sets a value indicating the selection mode used by the chart control (single item or multiple items). In the following example a new RadChart control is declared along with two series definitions - SplineAreaSeriesDefinition and BarSeriesDefintion. For example if HoverScope is set to InteractivityScope.Series for a given bar series, when one hovers over a bar item, the whole series will be highlighted (i.e. all of the other series within the ChartArea will become temporarily transparent); otherwise if HoverScope is set to InteractivityScope.Item, when one hovers over a bar item, only the respective item will be highlighted (i.e. all of the other series as well all of the other bar items within the originating bar series will become temporarily transparent). The same principle applies for SelectionScope as well - if it is set to InteractivityScope.Series, all items within the series will be selected; alternatively if it set to InteractivtyScope.Item, only the respective item will be selected. In order to enable the interactivity functionality you need to first set the interactivity scope for hover, selection, or both. The notion of "interactivity scope" specifies whether the chart control should interpret the interactivity action (selection or hover) on series level (if applicable), or on item level (if applicable). InteractivityScope.Item is not supported for series that do not render separate items (Line, Spline, Area, Range, and all their stacked versions). InteractivityScope.Series is not supported for radial series (Pie and Doughnut). There is one additional setting related to hover effects that can be set on global level - RadChart.HoverActivationDelay. This property gets or sets the delay before the hover effect is activated (by default there is no delay and the hover effect becomes active immediately). You could check out an online example here. The following code snippets represent the complete source code used in the topic.